The group exhibition Media Spaces, curated by Katrin Wolf and shown at the ARS ELECTRONICA FESTIVAL 2016, contains media projects that research innovative conceptual solutions within the realm where real and virtual spaces come together. They include artworks created with a focus on spatial aspects of media installations, including their dimension and perception, to show art works by nine young individuals who came to Berlin a year ago to study, work, and last but not least to live in the city of Berlin. 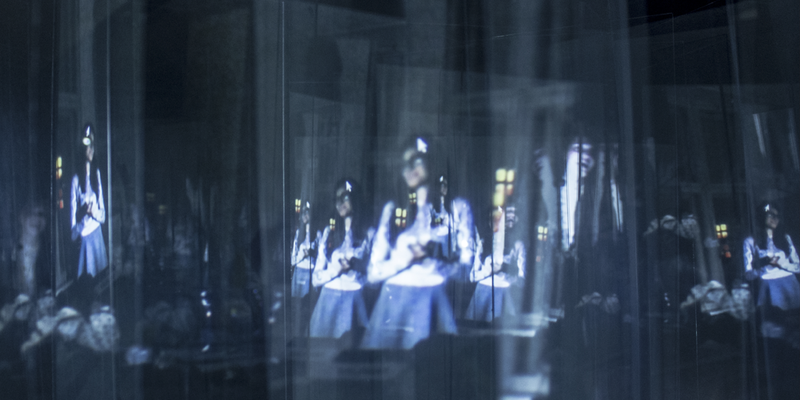 The group exhibition contains digital reflections, projections, ephemeral traces of images, kinetic and traditional sculptures, whispering plates, interactive laser pointers, mixed-media installations and visual illusions, which all represent artistic uses of media in a spatial setup. The projects are partly motivated by individual views on Berlin’s changing appearance, urban and intersocial phenomenon or the desire to heal “weather-sickness” (a term used here analogously to “homesickness”) when thousands of kilometers away from home. Other works aim to create novel expressions of inner and outer personal states. Such expressions, for example, are generated by morphing verbal secrets into motions of hanging metal plates, which creates a metallic whispering sound. Other works use ephemeral images of dancing bodies or express the sadness about the deforestation and the changing environment using traditional and new media. The projects were created by nine master’s students from the Media Space program of the BTK—University of Art and Design in Berlin. The students—supervised by Prof. Dr.-Ing. Katrin Wolf, Prof. Thomas Noller, Florian Kühnle and Steffen Klaue—come from all over the world. The exhibition is both an international and interdisciplinary group work, which benefits from the excitement of nine young people who came to Berlin from Pakistan, Russia, Ireland, Mexico, Columbia, Italy, Thailand, Lebanon and Iran to by inspired by the city’s free spirit and its unique pulse. This is what is currently attracting many creative people from all over the world to work and live between traces of the past, recent political changes and constantly appearing urban trends that from one day to the next are replaced by another. Sneak Peak realizes the idea of observing people without their knowledge in order to confuse the viewer as to the position of people coming view. As the view is indirect and conveyed through different mediums, it allows for playful interaction and enables people to distort their position in space, and relative reflection allows the viewer to see people colliding even when they are far apart. The process involves live video from exactly the same viewing angle as that of the setup. The real-time camera feedback is directed to a system that uses Quad FX sketchup to resize the image and computes the video in a constantly moving frame. This is further projected onto a translucent film in the concealed part of the setup, involving an angular arrangement of glass, which reflects it at many angles and thus projects a multiplicity of views. This creates uncertainty as to the reality of one particular view. 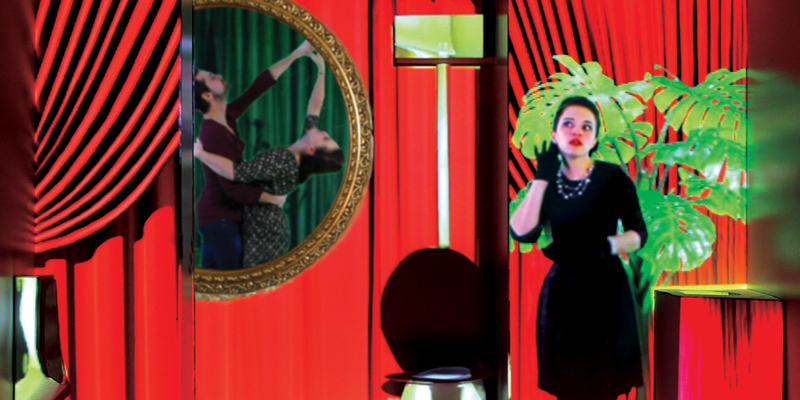 This project is a new way of exploring the boundaries of vision and perception. Supervision by Prof. Thomas Noller, Prof. Dr.-Ing. Katrin Wolf and Florian Kühnle. Movement, time and light are the key elements of this work in exploring the ephemerality of images. Ephemeral Dancers uses the idea of ephemerality to question our perception and to create an understanding of images as a transient result of the artistic process. 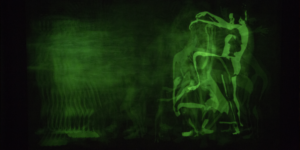 Dance, video and phosphorescence are the essential tools used for the projection of images onto a photosensitive surface. They appear, merge and vanish, allowing the viewers to see the impermanent essence of images. 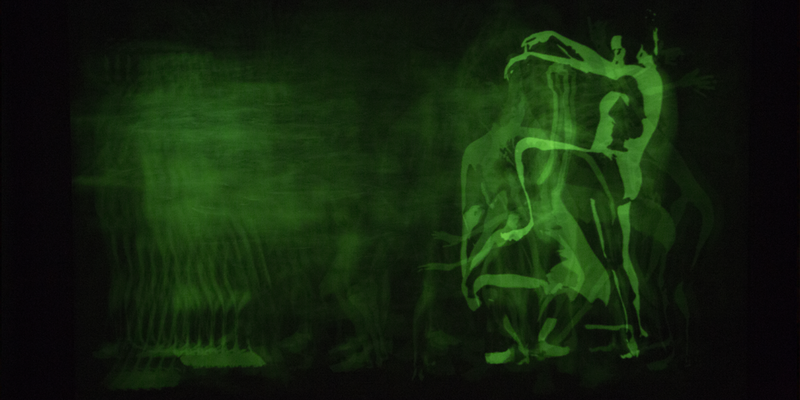 Thanks to the phosphorescent paint, images are transformed from video to brief light radiation that re-emits the video projection and which creates a multilayered video painting where movement and time are just traces of light. Supervision by Prof. Dr.-Ing. Katrin Wolf and Steffen Klaue. 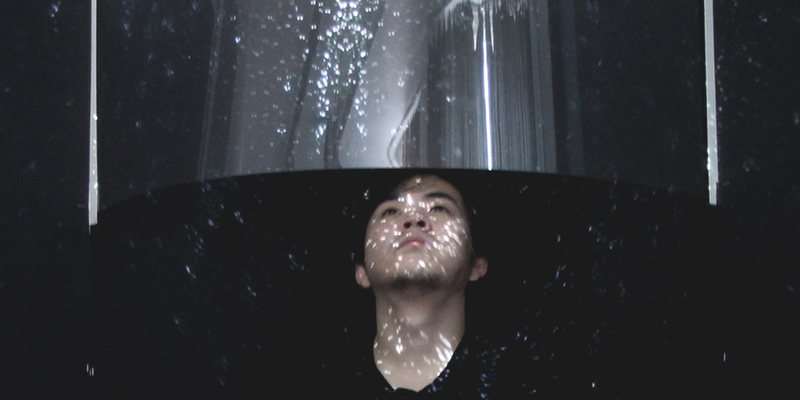 Raindrop Filter is a mixed-media installation that aims to relieve the symptoms of weather sickness or yearning for particular weather conditions such as rain. By recreating a beautiful experience of staying dry under a clear umbrella or staying indoors while looking out through window, it allows the viewer to be part of the reality, to be able to feel the weather close to their eyes (projected raindrops) and a surrounding (reality) farther away, acting as a camera lens filter or analog virtual-reality glasses. 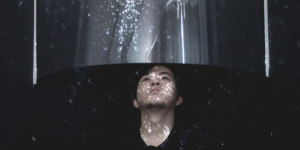 Sound and a video projection of rain falling on a transparent screen in different intensities creates a visual poetry of watching raindrops in the gallery and evokes the feeling of ambiguity between inside and outside. Supervision by Prof. Thomas Noller, Prof. Dr.-Ing. Katrin Wolf and Florian Kühnle. Rattle is a sound visualization of seismic waves. 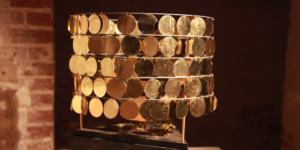 The project consists of a tubular bowl-like hemispherical container made of 18, 2.5-cm rectangular metal rods with a metal ball spinning around inside it. 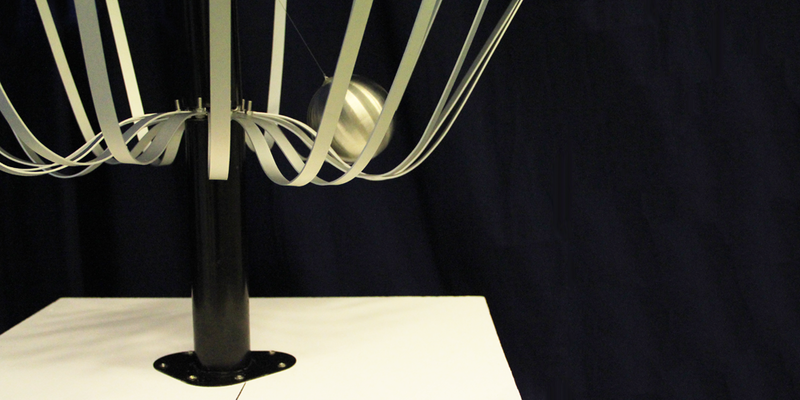 The ball is attached by a string to a motor at the centre of the tubular base and controlled by an Arduino microcontroller which changes the speed at which the ball spins according to the real-time data from the seismic station. The seismographs are processed and updated every second and the values are mapped in the microcontroller, so the speed changes accordingly. As the speed of the motor changes, the ball will hit the plates faster or slower. If the ball spins around faster the noise will rise until it resembles a kind of alarm system. The project is intended to represent the sound that rattlesnakes make by shaking their rattles when they feel threatened. Supervision by Prof. Dr.-Ing. Katrin Wolf, Prof. Thomas Noller and Florian Kühnle. The installation Whisper is based on a concept about spreading secrets by whispering. It creates a visualization of a whisper using a configuration of moving elements playing with light reflections. This project involves an experience mediated by a machine that enables an engagement with the public’s most intimate secrets. In fact it gives them the opportunity to explore the role of secrets in human behavior. 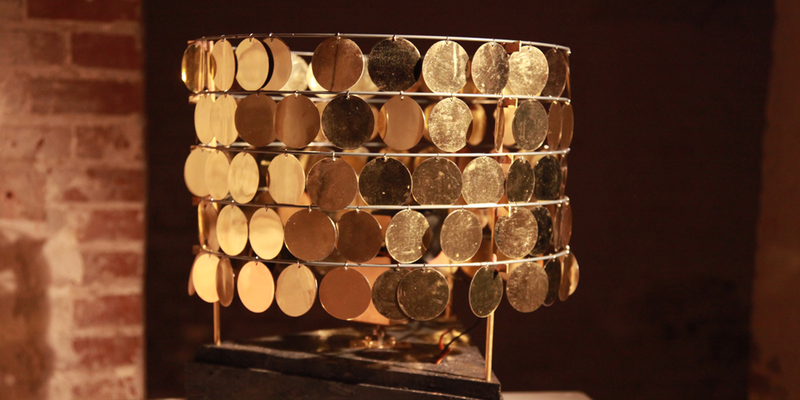 The cylindrical shape is a special design full of small, vertical, reflective gold plates. The circular gold elements of the structure reflect the light and create a choreography with the lights corresponding to the sound wave from the microphone. Supervision by Prof. Dr.-Ing. Katrin Wolf and Steffen Klaue. Post-Penetration is an installation showing the repercussions of human actions on the natural world. It combines both sculpture and documentary video. The video contains fragments of deforestation—carved, burning trees in a Moscow suburb. It was made under an emotional shock, while going from a suburb to the city center. 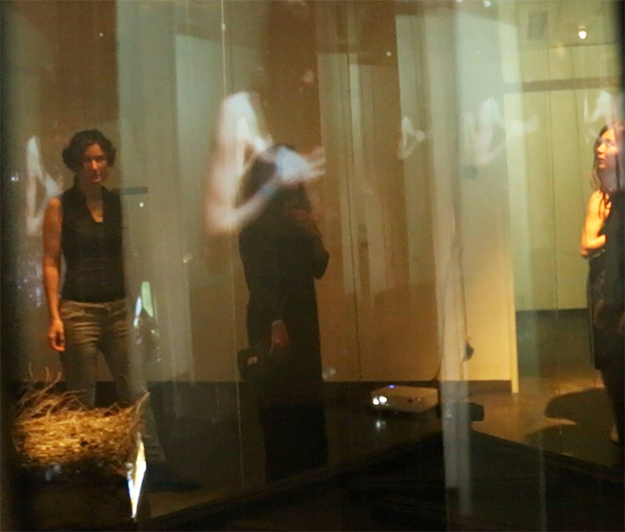 The video represents human actions, while the sculpture represents their effect. The sculpture is made of concrete and dead branches. 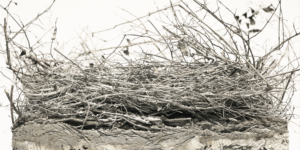 It is a square with an abandoned nest growing out of it. My personal sketches that I used to create the sculpture are attached. The sculpture’s rectangular form is reminiscent of a human habitation. 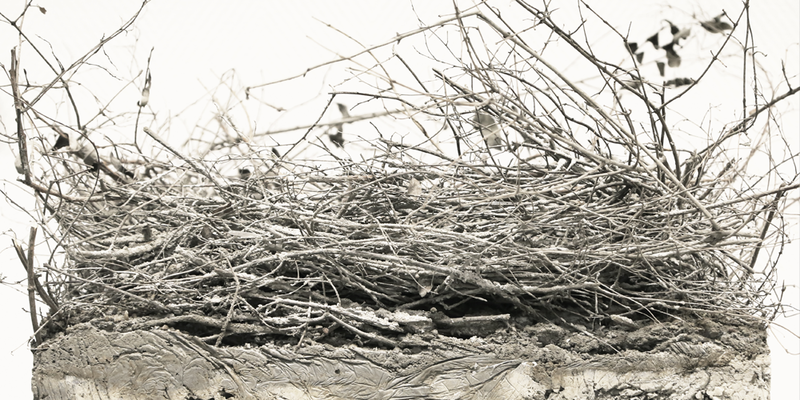 At the same time it includes some natural shaped elements, such as the nest is made out of dead branches. Concrete as a material also relates to human habitations (buildings, houses etc.) as well. Supervision by Prof. Dr.-Ing. Katrin Wolf, Florian Kühnle and Prof. Thomas Noller. Altered Atmospheres is an immersive experience which aims to capture the multifaceted and transitory nature of contemporary Berlin life. Through real film footage together with still photographs to evoke familiar interiors and activities, the viewer is encouraged to engage with the piece by way of the senses of sight, sound, smell, touch and taste. It examines the intersection between model-making and film and how these can be used side-by-side to transform reality and to create an altered space in time. This installation displays augmented realities of a public bathroom. The setting flickers and distorts, altering what we first assume to be true. A projection of images, live footage, a 60 cm x 60 cm x 60 cm paper model and sound are used to create this work. Supervision by Prof. Thomas Noller, Prof. Dr.-Ing. Katrin Wolf and Florian Kühnle. 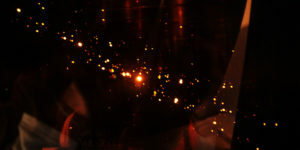 By studying their light we can understand the composition of stars that are light years away. The invention of the camera obscura was originally intended to stimulate philosophical reflection and speculation on the nature of perception and knowledge, the external world along with the eye and the brain (Jonathan Crary). 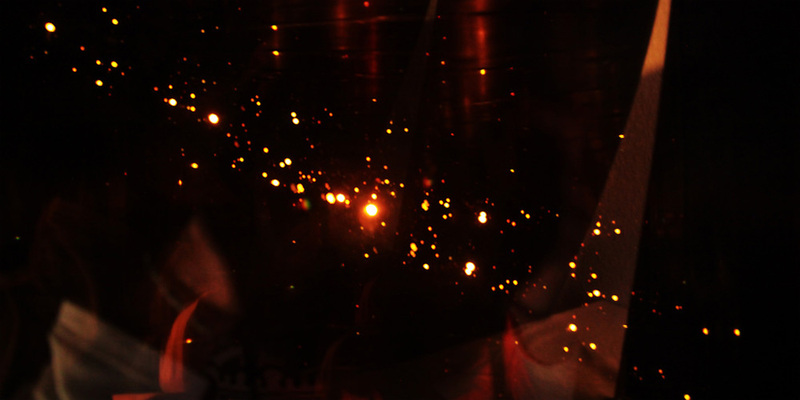 Thus we can perceive light not only in the subject of a real space but also virtually as the illusion of space. By placing four layers of reflective transparent glass inside a black box and a mirror with a pinhole in the back, we get to see reflections of light that multiplies infinitely in a closed system with a specific code. The camera obscura never fails to present several possibilities for shaping reality, neither by producing images nor by creating a surreal illusion or effect and reflecting an outer space structure. Despite its use in image production, the camera obscura may also be used as a Space Box. Supervision by Prof. Dr.-Ing. Katrin Wolf and Florian Kühnle. 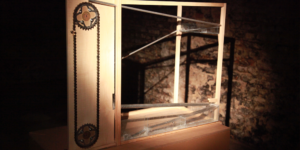 Incorporating movement into art is definitely the main concern of kinetic art. 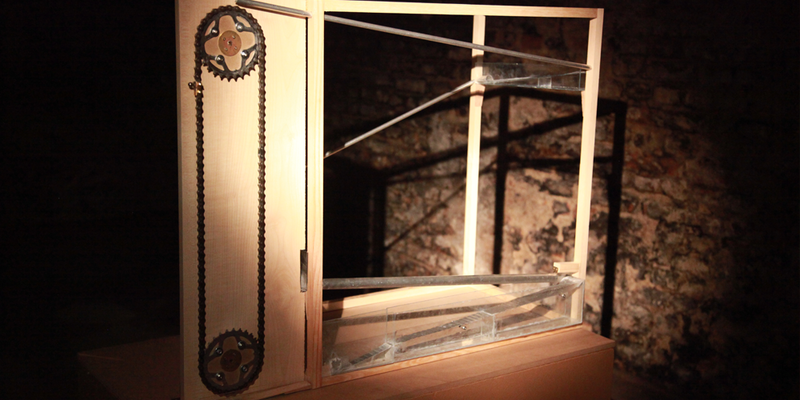 The idea of this project is about movement, the clashing of different objects in order to create a sound or rhythm. It is like an instrument which produces its own song, with the notes produced by a small metal ball moving over different surfaces and through pipes. 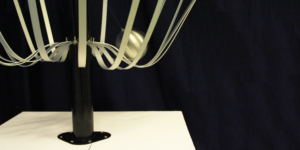 The ball moves first from a pipe, goes over ramps, and then a magnet connected to a motor-driven chain starts the loop over again by catching the ball and lifting it back up to the start. Supervision by Prof. Dr.-Ing. Katrin Wolf and Steffen Klaue.